Home » Toynami » PRAYER ANSWERED - Vehicle Voltron from Toynami! PRAYER ANSWERED - Vehicle Voltron from Toynami! Following the Voltron and the Robotech Zantraedi Tactical Battlepod is the third installment of the Toynami Robot Vinyl Collection, the Vehicle Voltron! 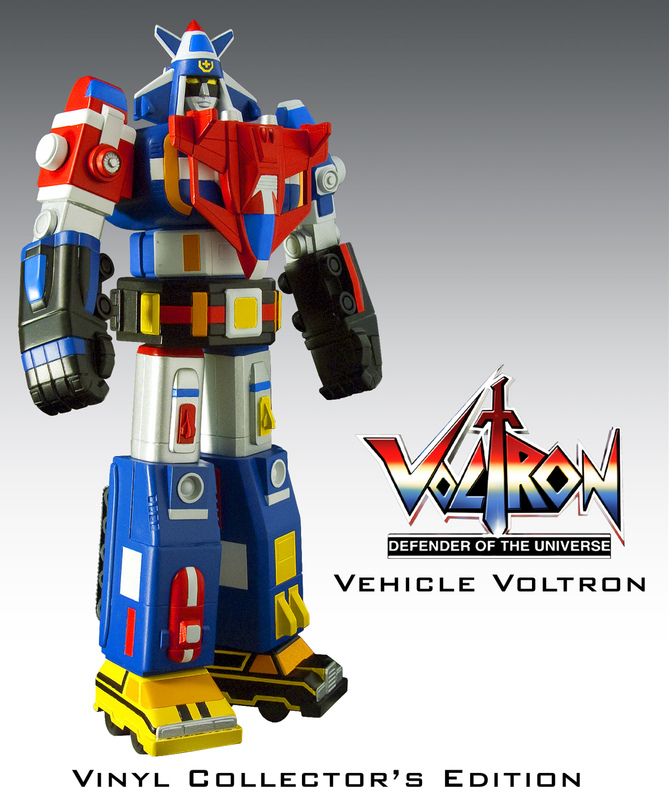 "The newest vinyl Voltron: Defender of the Universe figure is here! This new collector’s edition of the “Vehicle Voltron” stands 9 inches in height. (Note: this figure is not transformable.)" The figure stands approximately 9" tall, and is fully articulated. SRP $35.99, due APRIL 2010! oh, and I heard a BIG rumor.. about something at toy fair. It is sure to be BIG news. I got so excited cause I thought we were getting a Masterpiece Vehicle Voltron, but oh well I guess this is a start. That was my first thought too. Hopefullly this will sell well enough to make that happen. On another note, no copter blades on those shoulders?? What's the red thing on it's chest? I don't think I remember seeing that before. Haha, nice one, I am still missing the red ship for mine. 1. I wish it was a masterpiece version, or at least transformable in some way. 2. No helicopter blades on the shoulders really makes it look strange. What was the rumor?!!! Is Toynami coming out with a Masterpiece Vehicle Voltron as well??? Come on...! Only your own aura could direct you which path you wish to seek for it's answer. You can say the word BIG all you want, I'm not gonna believe there will be a jumbo Dairugger coming out. Wow,the paint on that looks really nice. Coincidentally,I just bought the lion one like two days ago. Was really hoping for a Masterpiece when I saw this news item. :< Now I'm sad.